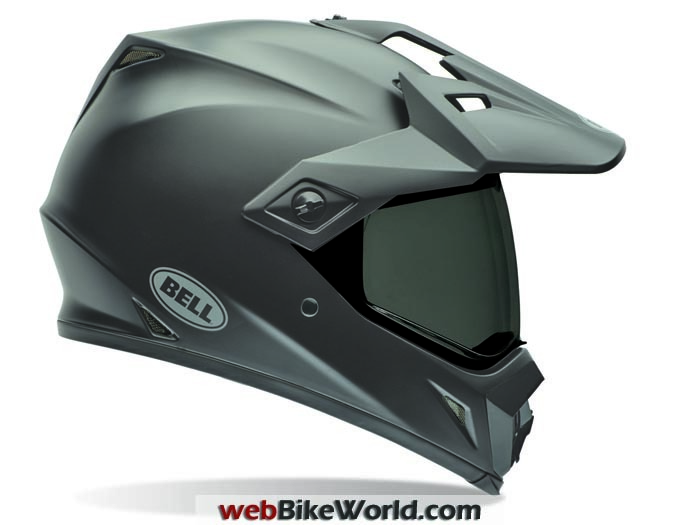 October 10, 2014 (Press release edited by webBikeWorld.com) – Bell Helmets has announced two new helmets. First is the company’s first dual-sport helmet, the “All-Terrain MX-9 Adventure”. The design is said to have been inspired by the popular Bell off-road helmets, including the Bell Moto-9 (Preview). Here’s are some photos and the edited version of the Bell press release for the new MX-9. 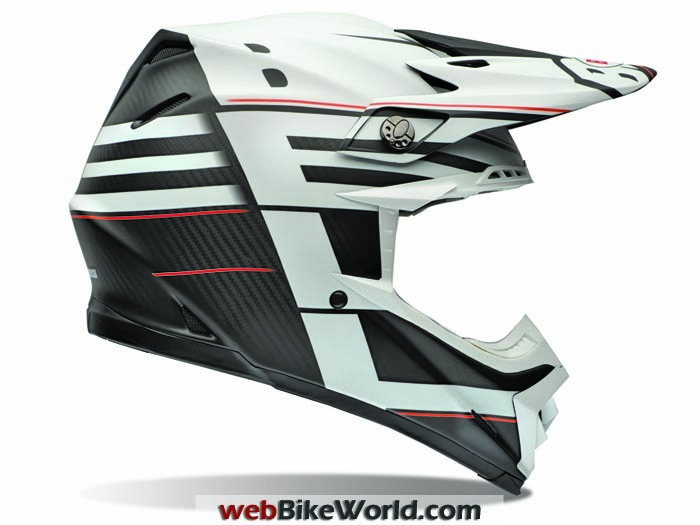 UPDATE: More info on the new 2015 Bell Helmets from the webBikeWorld AIMExpo show report. Bell MX-9 Adventure in the Barricade Hi-Viz graphics. Bell MX-9 Adventure in Matte Black. With a growing demand for dual sport helmets, Bell created a helmet versatile enough for off-road conditions, while comfortable enough for sustained on-road riding. With a design inspired by Bell’s dirt and street helmets, the MX-9 Adventure incorporates elements of each for a one-of-a-kind helmet capable of offering unmatched protection for street and off-road riding. The integrated face shield is made for street riding, and when raised, designed to fit goggles needed for off-road riding. 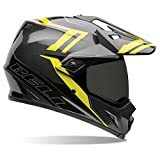 The dual sport helmet also incorporates Bell’s top-of-the-line Velocity Flow Ventilation system, and an adjustable mouth vent for riders to control air intake for increased comfort. Lightweight injected polymer composite shell. Three-shell and EPS sizes for a personalized fit. Velocity Flow Ventilation system for cooling and comfort. The MX-9 meets the DOT helmet standard in the U.S.A. Available sizes are XS, S, M, L, XL, XXL. The helmet will be available early 2015 at select retailers. The MX-9 Adventure will retail from $189.95 to $199.95. Bell Moto-9 Flex showing new impact protection technology. 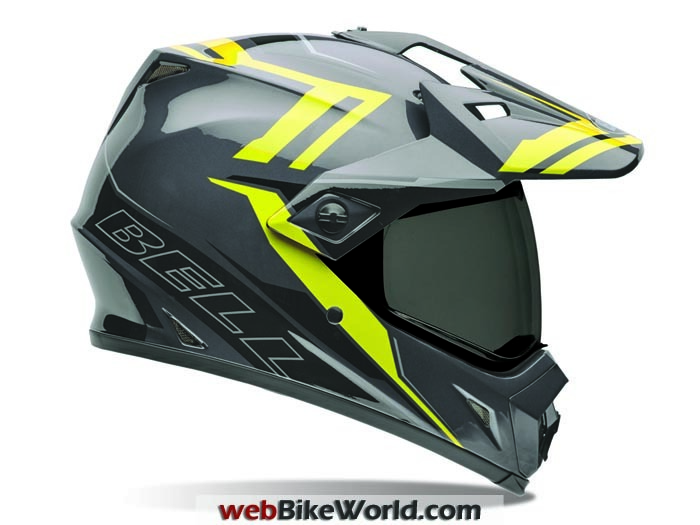 Bell Helmets has introduced the Moto-9 Flex, its newest motocross helmet offering what is claimed to be “a radical advancement in managing energy across the wide array of impact scenarios common with off-road motorcycling”. At the heart of the Moto-9 Flex is Bell’s exclusive “progressive layering” technology; a system of three unique protective materials, each designed to address specific impact velocities while simultaneously working in harmony to deliver what the manufacturer calls their “most comprehensive level of protection available today”. With helmet manufacturers recently touting innovations for specific scenarios, such as low speed or rotational impacts, Bell has created a helmet that effectively addresses various possible scenario, including high, medium or low speed, or rotational impacts. In off-road racing, where a bevy of impact scenarios are possible, it seemed only logical for Bell to develop a helmet that effectively addresses many potential impacts. Together with the Advanced Concepts Group at BRG Sports, Bell discovered Expanded Polyolefin (EPO), which actually works in tandem with the often used Expanded Polypropylene (EPP) and Expanded Polystyrene (EPS) layering systems. EPO is a soft and flexible low-density polymer that, when placed between the EPP and EPS layers, dampens low-threshold impacts. By combining these three materials at varying densities Bell has created an energy management system that excels in low, mid, and high-speed impacts. Along with the three potential impact speeds, Bell has addressed rotational energy management by engineering a “slip zone” within the Moto-9 Flex impact liner. The “slip zone” allows for subtle movement between the inner layers and works to reduce rotational energy transfer from angular impacts. This is similar in concept to the Lazer Rider Superskin helmet (review), which has its “slip zone” on the outside. 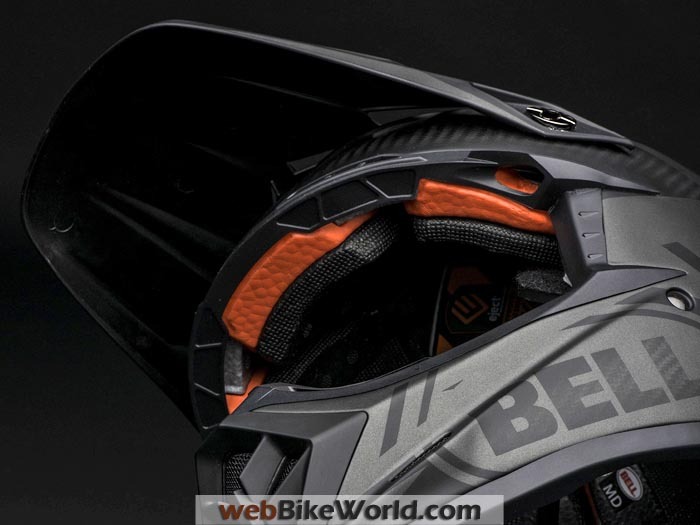 Bell also addressed head comfort with the Moto-9 Flex, with its Adaptive Fit system containing a segmented construction in the EPO layer, which conforms to a rider’s head for a better fit and more predictable energy management. To further improve comfort, Bell included its top-of-the-line Velocity Flow Ventilation system, which offers maximum helmet ventilation and temperature control. Lightweight Composite Carbon shell Velocity Flow Ventilation system for maximum cooling. Exclusive Magnefusion Emergency Removal System (MERS) cheek pads. QuickFlip visor screws for easy adjustment even when wearing gloves. Fully ventilated EPS-lined chin bar. New and Improved Exclusive Magnefusion magnetic chin strap keeper. The Bell Moto-9 Flex meets both the new Snell M2015 and DOT safety standards. Sizes: XS, S, M, L, XL, XXL. Available early 2015 at select retailers for $599.95. For more information on the helmet please visit www.bellhelmets.com.